Riding tractors and walk-behind mowers cut the time it takes to mow the lawn, but no matter what type you use, eventually it needs replaced. Deciding what to do with the old one depends on the condition it's in and how enterprising you are. Some mowers can be sold for a little money, but you may prefer to donate it or recycle it. Man taking apart small lawn mower. If the frame on your mower is rusted out and the engine still runs, consider selling your mower for parts. It can be sold as a unit or parted out to several buyers. Many do-it-yourself mechanics buy used parts to keep their mowers going because it's cheaper than buying new ones. Find perspective buyers by listing your mower in a local newspaper or online classified. Include the year of the mower, engine size, deck width, model number, condition and whether you want to sell the mower intact or as parts. This helps potential buyers determine if your machine meets their needs. If you just want to cart your mower off and not have to deal with selling it, take it to a local junkyard. Most buy mowers at scrap metal prices that fluctuate daily in accordance with the market. You won't get as much as if you parted it out, but engines and some decks are made with aluminum castings. Find out if your deck is aluminum by placing a magnet on it. If it doesn't cling to the deck, it may be aluminum. Junkyards usually pay aluminum breakage prices, which is more than they pay for plain steel, for a mower sold as a unit. If you are feeling industrious you can take the mower apart and separate the pieces by metal type; a labor-intensive project that's usually not worth the extra effort. 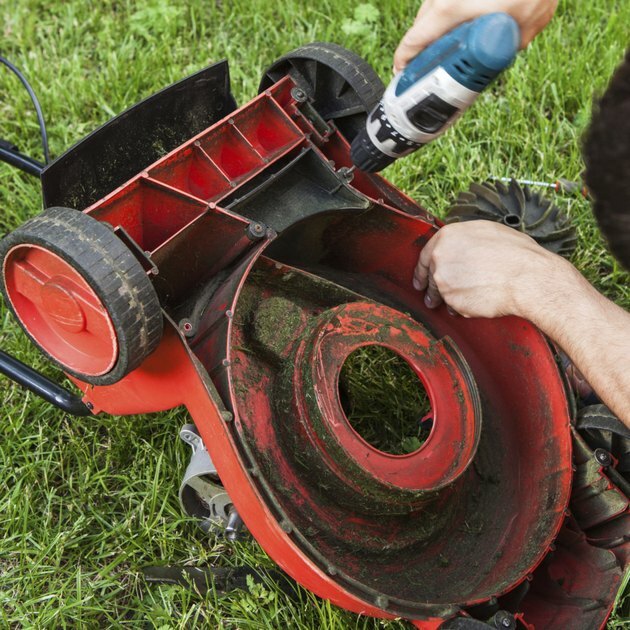 Whether you scrap the mower as a unit, or break it down, first drain the gasoline from the engine into a Department of Transportation-approved container. If your mower is still in working condition, you can dispose of it by donating it to a local charity.Some charities accept working lawnmowers in good condition to sell and use the proceeds to fund programs within the organization. If you plan to donate your mower, check with the charity to see what condition it requires it be in. Most expect it be washed and ready for the new owner to use. Drain the gas before you donate it. It may be several weeks before the mower sells and stale gasoline makes an engine hard to start. Today most anything can be recycled including your unwanted riding or walk-behind mower. Many county recycling agencies recycle mowers at no charge to you. Check with the recycler to find out how to prepare your mower before dropping it off. At minimum you will need to drain the gas and oil from the engine. Put them in DOT approved containers and dispose of them at your local hazardous waste agency.